No creative inspiration gets in the way of the beautiful people running and jumping and kissing while things go boom in the forgettable teen sci-fi actioner I Am Number Four. 104 min. DreamWorks Studios. Director: D.J. Caruso. Cast: Alex Pettyfer, Timothy Olyphant, Teresa Palmer, Dianna Agron, Kevin Durand. If we all think about it—and squint at the screen real hard—we can all tell when there's any kind of creative inspiration going on in screen fare and when there isn't. No creative inspiration gets in the way of the beautiful people running and jumping and kissing while things go boom in the forgettable teen sci-fi actioner I Am Number Four. I know what you're thinking: lighten up, dude—it's a teen sci-fi actioner! But seriously, I Am Number Four is pretty boring. The new refrain among critics is to sigh verbally about how transparently each film has become a product, and I do so hate to disappoint. I Am Number Four is a naked attempt to squeeze some cash out of the trends in two-quadrant teen entertainment, starting with Twilight and extending to CW shows like Smallville and The Vampire Diaries. Monster-mash up some old-school teen romance with some sci-fi or fantasy, and you get the Hollywood greenlight, quality notwithstanding. Have we learned nothing from Teen Wolf? (Um, no. That one's getting an MTV reboot. Say it with me now: sigh.) So I Am Number Four is based on a young adult science fiction novel by "Pittacus Lore" (a pseudonym for everybody's favorite lying liar James Frey and Jobie Hughes). Adapted screenplay credit goes to Alfred Gough & Miles Millar (Smallville) and Marti Noxon (TV's Buffy the Vampire Slayer). Ka-ching, ka-ching, and ka-ching. Pleasure doing business with you. The story concerns, well, y'know, Number Four (Alex Pettyfer), an alien sent from Lorien to Earth to escape the genocidal Mogadorians (not to be confused with George Lucas' midichlorians). Like Earth teens, Number Four is sullen and rebellious to his adoptive caretaker. Henri (Timothy Olyphant) would rather see Number Four under lock and key all the time, since the Mogadorians have been counting to nine, murder-style: so far, they've killed three of Number Four's special brethren, so the heat is on. But Number Four can't take the boredom, and he wants to meet Earth girls, so he's always running off to jet ski or, when a jet ski isn't available, go to high school (hey, it's better than doing nothing!). And that is how Number Four takes the name John Smith and starts mackin' on Dianna Agron of Glee. The mythology that emerges just gets sillier and sillier, though nothing is more ridiculous than the Mogadorians themselves: inconspicuous tall, bald fanged, fight-picking jerks with tattooed heads and black trenchcoats. As the lead Mogadorian, Kevin Durand of Lost entertains himself seeing how much overacting he can get away with (more than you would think), while Olyphant mostly just tries not to look embarrassed he's in this thing. As the Mogadorians descend on smalltown Paradise, Ohio, "John Smith" goes through superhero puberty, amateur shutterbug Sarah Hart (Agron) bats her eyes at him, and self-confessed science nerd Sam Goode (peppy Callan McAuliffe) tries to warn John about bully-jock Mark James (Jake Abel). More clichés on aisle nine! Though the source material seems mostly to blame, the dull leads and artless director D.J. Caruso (Eagle Eye) are no help. I Am Number Four is about an hour of turgid melodrama and wan sci-fi (Smallville style), followed by a half hour of alien conspiracy revealed (The X-Files) and about ten minutes of all-heck-breaks-loose fighting and explosions (The Terminator). It's in the home stretch that Teresa Palmer arrives to play Terminatrix, and when the movie is in action mode, it does dole out some impressive stunts, but it's all too little, too late, and in service of a tired aesthetic that owes to bad comic books and worse video games. Parting shot: I Am Number Four is produced by Michael Bay. 'Nuff said. 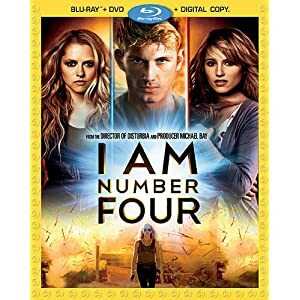 Fans of I Am Number Four will appreciate that it's now available in Blu-ray, DVD and Blu-ray + DVD + Digital Copy Combo Pack editions. The hi-def transfer on this one is a beaut: though it can get a bit rough in the shadows (and there is a fair amount of night footage), the image gets high marks for sharp detail and vibrant color, and even the dark scenes seem to be maximizing the source material. As for the DTS-HD Master Audio 5.1 surround mix, it's state of the art theatrical audio, with clear, well-prioritized dialogue, plenty of wraparound engagement and serious oomph when the action breaks out. Bonus features are quite limited, which would seem to reflect a lack of confidence in this stillborn franchise. Six Blu-ray-exclusive "Deleted Scenes" (18:58, HD), introduced by director D.J. Caruso, include "Extended Strangers in Paradise," "Sam's Mom," "Worth Mentioning," "Power Prank," "Trying to Connect" and "Extended Warsaw Basement." These are a nice added enticement to fans to pick up the Combo Pack or the Blu-ray, which certainly offers superior A/V over DVD. "Becoming Number Six" (11:44, HD), the only featurette, chooses to focus on making a star of Teresa Palmer. Palmer gets plenty of interview clips interspersed with footage of her rehearsing and performing stunts; also interviewed are Caruso, Afron and Pettyfer. Last up is a reel of "Bloopers" (3:15, HD) that is most entertaining. All site content © 2000-2019 Peter Canavese. Page generated at 04/17/2019 08:39:57PM.